Vector the Crocodile (ベクター・ザ・クロコダイル) is a character from the Sonic the Hedgehog franchise of video games and related media. First introduced in the game Chaotix, Vector has become one of the more popular characters of the "second tier," fan demand being enough to reintroduce him in the game Sonic Heroes. Vector the Crocodile in the unused "Sonic Band." Although first seen by the public in 1995's Chaotix (known as Knuckles' Chaotix in western territories), Vector the Crocodile was actually conceived back in 1990 during the initial conceptual stages of the original Sonic the Hedgehog. After establishing Sonic the Hedgehog and Dr. Eggman as the protagonist and antagonist respectfully, the developers at Sonic Team were quick to build a world around the blue hedgehog, with such concepts/Development as Sonic having a human girlfriend and being part of a band bounced around before ultimately being dropped. The latter of these two was where Vector came about, drawn as a keyboardist in Sonic's motley crew. 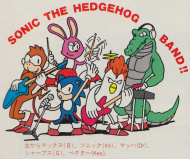 The band was intended to be utilized in the sound test of the game, but as development time grew short the team was forced to drop the animation, something that Ohshima was none too happy with. The extra cartridge space was instead devoted to the classic "SEGA" chant heard at the beginning of the game. While the other three musicians were quietly forgotten, Vector would be given a second chance at life, retooled from the sketches Naoto Ohshima had made of the band. Made slimmer (and slightly "hipper"), Vector became one of the more visually unique looking characters within Chaotix, the only Sonic the Hedgehog platformer to grace the ill-fated Sega 32X. Though his only appearance in the classic series, Vector became a memorable addition to the cast, and was resurrected once more in the 2004 game Sonic Heroes. Redesigned by Yuji Uekawa, Vector was given a stockier build to match up with the "Power" role designated to him in the gameplay. Though he had been previously established as a character, Takashi Iizuka, the Director of the game, felt it might be better to treat Vector and the rest of Team Chaotix as new characters, though nothing in the game (aside from Charmy Bee's confusion over Dr. Eggman's name) made the trio feel like they were created specifically for the game. Vector's first playable appearance in the 32X title Chaotix. The details of Vector's origins, such as where he was born or who raised him, is just as shrouded in mystery as it is for much of the cast of the game. While it is possible Vector once played piano in a band, the first known appearance of the character was when he journeyed to a mysterious island that had appeared in the aftermath of the Death Egg saga. Not knowing that the island had been pulled up from the ocean depths and turned into a tropical paradise from the powers of the Master Emerald, Vector heard the rumor that a miracle of God had caused the island to appear. Intrigued, the crocodile traveled to the island to investigate himself and see the miracle firsthand. Instead of having a spiritual moment, Vector was caught up in the latest scheme of Dr. Eggman, the mad genius who had already turned most of the island into his own personal fortress, the Newtrogic High Zone. Teaming up with Knuckles the Echidna, Espio the Chameleon, Charmy Bee and Mighty the Armadillo the group foiled Eggman's plans on securing the Chaos Rings that hid on the ancient ground, in the process defeating Metal Sonic and his newest form. While the group went their separate ways after the adventure, Vector, Charmy and Espio would eventually reunite, resurrecting the "Chaotix" name. Taking up the occupation that Espio already had when they first met, the three decided to form the Chaotix Detective Agency, Vector becoming the head of the operation. Though the intent was to earn money, more often than not the group would take on cases without payment, putting the group in an eternal circle of being short on cash. With a policy of never turning down work that paid (unless it was connected to some wicked deed), the trio were once again tangled into the antics of Dr. Eggman when they received a job from a mysterious client who only communicated with them through a two-way radio. Nearly from the start, Vector began to suspect the true identity of their client, putting the clues together between the sometimes inexplicable tasks they were given and the comments he heard over the radio. In the end, his suspicions proved to be correct, that the voice did indeed belong to the mad doctor, who had been imprisoned within his latest flying fortress by his own creation, Metal Sonic. Once again, Vector, along with the rest of the Chaotix, teamed up to stop the robotic doppelgänger of Sonic the Hedgehog. Vector and the rest of the Chaotix performing in Sonic Heroes. Vector the Crocodile is a green-hued 20 year old croc who lives either in or near the offices of the Chaotix Detective Agency. Being the head of the three-member agency, Vector is divided between his natural easy-going nature and his also-natural state of being bossy and in charge. Much of his behavior is geared around one of his great loves of life - money. Becoming the leader of the CDA was done with the goal of becoming successful, and letting the cash roll in. However, the want of cash is not able to overcome Vector's essential core values, including a strong sense of justice and the desire to be kind. It is this reason that, more often than not, the cases taken up by Vector and his Chaotix crew are done without any sort of compensation, knowing that they've helped out those less fortunate being the only reward. As a result, Vector is caught up in a circle of being eternally poor, which wouldn't be all that bad if he could avoid having to deal with his landlord, constantly forced to work just so he can pay the debts that continuously pile up. If there's one thing that can rival Vector's love of money, it would have to be his passion for music. Never seen without his trademark headphones, the crocodile is always in a perpetual state of groovin', often being seen turning up his current jam and becoming oblivious to the world around him. Also enjoying dancing and always looking for an opportunity to be part of a band, Vector's music drives him just as much as anything. Even if he listens and plays loudly, Vector only enjoys the music if it sounds good, disliking general noise. Similar to Knuckles, Vector's strength and general attitude makes him quick to get into a fight, possessing an arsenal of natural abilities that allow him to defend himself in times of trouble. Just as Sonic, "Tails" and many other members of the cast, Vector is able to curl up his body and perform a variant of the spin attack, the red protrusions on Vector's back serving the same purpose as Sonic's spines. Being able to charge up before running off, Vector is able to perform the spin dash, although his top speed is nowhere near that of Sonic's. Vector is also able to emulate some of Knuckles' patented moves, including climbing walls and, with the help of bubble gum, gliding. The green detective also has his own form of double jumping, able to perform a midair dash, changing his trajectory in the process. Vector's jaws can prove to be quite valuable, the strength within enough to break through even the toughest of obstacles, though he can be delicate with them as well, such as when he uses them to hold Espio and Charmy in his mouth and shoot them out at enemies. His voice also can be used as a weapon when done in conjunction with the other members of the CDA, performing the Chaotix Recital, though it is unknown if the croc is able to sing without causing destruction. Finally, Vector is able to occasionally shoot fire out of his mouth, able to knock back or destroy enemies. There are times when nothing but bubbles will emerge, though they still have the same effect when in combat. All in all, Vector is a capable leader, and though his rough exterior and speech patterns can throw some people off, is quite intelligent in his own right. Though quick to fight and often looking at peaceful solutions as a last resort, Vector is nonetheless an optimist at heart. Vector is also quite fond of basketball and sports drinks. Just like many of the characters in the Sonic the Hedgehog franchise, Vector the Crocodile has made the jump to television and the printed page. Vector's introduction in the Archie universe. Hatched as an orphan, Vector's early years were in the land of Downunda, though he was never content with his home. Originally living with other orphaned children, Vector eventually migrated, finding a way onto the Floating Island. Not wanting anyone to know of his true heritage, Vector began speaking in "street lingo," hiding his Downunda accent from anyone who might be curious as to his true origins. Living on the island, it was only a matter of time before he would run into Knuckles the Echidna, who at the time had not yet become the guardian of the Chaos Emerald that kept it afloat. Though their first encounter began with a fight, they would eventually become friends, especially after Knuckles' father disappeared into the Forbidden Zone. Though their friendship at first was Knuckles keeping Vector out of trouble, the music-driven crocodile became one of the charter members of the Chaotix when, years later, the island was threatened by Dr. Robotnik. Having lured every known Freedom Fighter onto the island for a carnival, the heroes were trapped by one of Robotnik's henchmen, Renfield T. Rodent, the one who invited the residents of Knothole Village in the first place. With Knuckles being the only one to escape and his unique abilities stripped away, Vector along with Espio the Chameleon, Charmy Bee, Mighty the Armadillo and the robotic pair Heavy and Bomb proceeded to assist Knuckles defeating Robotnik once again, freeing everyone and restoring the echidna in the process. The group quickly became Knuckles' support in helping to defend the island from intruders, but it would not be long before Vector and the rest of the Chaotix would find themselves kidnapping victims, snatched up by the mysterious Archimedes. Instead of being in the hands of some new villain, however, the Chaotix discovered the true identity of their kidnapper, a fire-ant who was offering a guiding hand to help train Knuckles, this being the latest lesson. Vector was quick to accept his word even if the guardian, once he found his friends, was not. The meeting between the two was short lived when Enerjak, a crazed Chaos Energy-powered Echidna from thousands of years past, broke free from his prison, capturing the Chaotix and turning them into his personal army. Forced to fight with his friends, Knuckles was able to learn to trust Archimedes, using the fire-ant's help to defeat Enerjak and free the Chaotix from their mind control. Vector would next be thrown into the return of the Dark Legion and, eventually, the lost echidna civilization. As a result of the Ultimate Annihilator that was activated during the final battle between Sonic and Dr. Robotnik in the Endgame saga, a group of cybernetically enhanced echidna's known as the Dark Legion broke free from their universal imprisonment, looking to rule the world they had once been banished from. Among their ranks was Julie-Su, who immediately attacked Vector once she spotted him, later engaging the whole of the Chaotix including Knuckles the Echidna. While she eventually defected from the villainous Dark Legion, it would be quite a while before Vector would learn to trust her, uneasy with befriending former enemies. He eventually grew to be a friend as Knuckles began to pursue a relationship with the girl. Remaining a steady member of the Chaotix and a close friend of Knuckles, Vector would find himself roped into battle time and again, and during the guardian's brief "death" wound up comforting Julie-Su by recounting how he and Knuckles had become friends in the first place. In the wake of the echidna's return and Sonic's year-long disappearance, events forced Vector to live in Knothole for a time until the Floating Island could become liberated from both Dr. Eggman and the Dingos that had taken over. Having a brief stint as a bodyguard for Mina Mongoose, Vector eventually returned to Angel Island to watch over Knuckles, in the aftermath of his friend's brief transformation into a new version of the villainous Enerjak. Helping to guard the Master Emerald, Vector, in a moment of reflection, realized how helpless he felt during the entire ordeal. Determined to not let such a thing happen again, Vector began to train himself, the once thin and lanky crocodile transforming into a powerhouse of strength. The Chaotix as first depicted in Sonic the Comic. 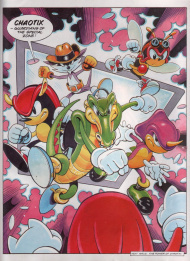 Within the pages of Sonic the Comic, Vector the Crocodile is the leader of the Chaotix Crew, a team consisting once again of Mighty, Espio and Charmy. All natives of the Special Zone, Vector was born and raised in New Tek City on the planet Meridian. Often portrayed as the "straight man" of the group, the crocodile is also a close friend of the Omni-Viewer, a sentient energy field that formed the Chaotix team to protect the Special Zone from anyone who dared to invade, a response to Robotnik's brief occupation. Originally having a fifth member, Nack the Weasel, the group first encountered Knuckles mistakenly thinking he was still working with Dr. Robotnik. Realizing the error of his ways and that the echidna had only been tricked for a brief period, the Omni-Viewer called off the attack. With Knuckles befriending the group, he was at the right place at the right time to witness Nack's betrayl of the Chaotix and the Omni-Viewer to the Brotherhood of Metallix, a fleet of Sonic-inspired metallic duplicates that had gone far beyond their original programming. Working together, Knuckles and the Chaotix were able to rescue the Omni-Viewer and defeat the Metallix, if only temporarily. Later on, Vector would be invoved in the final defeat against the Brotherhood, even though it would be Dr. Robotnik who ironically caused the final blow. Vector and the rest of the Chaotix would later meet up with Sonic once more when, after being split from his super form, went to the Special Zone to warn the Chaotix of the terror that now existed in their home front. Using the Omni-Viewer to transport to the realm of the Chaos Emeralds, Sonic and the Chaotix worked together to try and stop the homicidal doppelgänger. When the Omni-Viewer became a temporary prison for the crazed being, Sonic found himself stranded in the zone, working with the Chaotix until he could finally return to Mobius. Vector breaking the fourth wall, introducing himself to the viewing audience of Sonic X. Not appearing until well past the halfway point, Vector the Crocodile (along with the rest of the Chaotix Detective Agency) made their first animated appearance in the Japanese series Sonic X. Only appearing in one episode in the first series (the appropriately named "The Chaotix Detective Agency"), Vanilla the Rabbit hires the team to find her daughter Cream, having not seen her since before the events of the first episode. Tracking down Cream to the Thorndyke household, Vector is quick to accuse Sonic of kidnapping the girl. However, the troupe soon realize their mistake when Sonic arrives with Cream's mother, who thanks both Vector for searching and Sonic for taking care of her daughter. Confused, Vector attempts to pretend that the mix-up never happened, avoiding the questions being thrown at him by Sonic and Amy Rose. The group has a much larger role in the second season of the show, Vanilla contacting the Chaotix when Chuck Thorndyke figures out a way to send material goods through the portal between his world and Sonic's. Also sending along a spaceship, Vector and the others journey off to where the Blue Typhoon is, carrying Sonic and the gang as they attempt to find and defeat the Metarex. Through confusion on both sides, the Chaotix's ship is attacked, being mistaken for an enemy vessel, and later Vector kidnaps Cream thinking that her mother wanted her safe return, echoing their original appearance in the show. Eventually things are squared away, and the Chaotix show up periodically through the rest of the season. In one notable episode, Vector takes it upon himself to push the budding relationship between Miles "Tails" Prower and Cosmo, a plant girl introduced in the Metarex-fueled storyline. Thanking the young fox for helping to fix his ship, Vector tries to help "Tails" woo the young girl's heart. It is also implied that Vector has a crush on Vanilla the Rabbit. Vector making his entrance in Sonic Boom. Vector makes a surprise appearance in the second season of the Sonic Boom television series as a solo detective with his own crime investigation reality show on the local television network. While he is rough-speaking and has an attitude, he is a professional and honest detective who sees his cases through until he deems them to be solved. When Amy's hammer went missing, Vector helped Team Sonic track it down. Vector's design in Sonic Boom is virtually identical to his main series counterpart, except he has swapped his headphones for a black leather jacket, a tattoo on his right arm, and, like other characters in the franchise, sports tape. Though originally listed as 16 in the Japanese manual of Chaotix, Vector went through the same type of age changes much of the cast has been forced through. For his reintroduction in Sonic Heroes, the crocodile was aged four years, similar to the aging process Amy Rose went through in Sonic Adventure. The character was also redesigned to look far stockier than in his first playable appearance, in order to better suit his role as the "power" member of the team. In an interview regarding Sonic Heroes, Takashi Iizuka stated that, in his mind, he didn't bring back Vector, Espio and Charmy as characters from the past. Instead he considered them to be new characters, recreated from the ground up. This explains why, in Sonic Heroes, Vector, Espio and Charmy show no familiarity with other characters they had previously featured alongside. At one point in the game, Charmy Bee asks who Dr. Eggman is, although Espio has heard of him. Dropped from the final version of the original Sonic the Hedgehog, Vector (along with bandmates Sharps, Max and Mach) were still used in the Sonic the Hedgehog Story Comic. Given cameo roles in the first issue, there were just one of many early elements from the game that were either changed or removed yet still featured in the comic.